VicForests claims that ‘contractual obligations’ are behind the need to log 27 ha of some of the best forest left in the Strathbogie Ranges (Country News 21.9.16). In the same article VicForests stated that it notified community groups of the impending logging and that the sign nailed to a tree related to the safety zone area. These statements are completely misleading and border on deception, according to Strathbogie Sustainable Forest Group spokesperson Fiona Townsend. 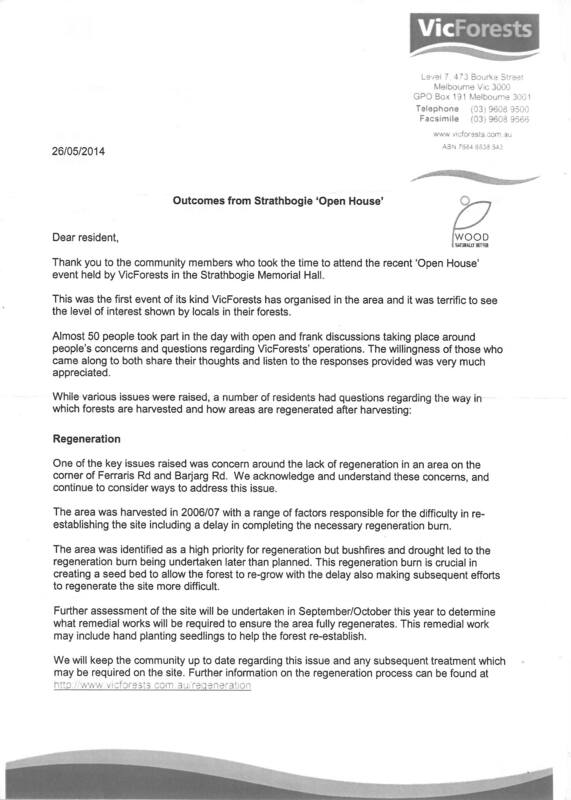 “The Group have been in discussion with VF and the Victorian Government about the 11 coupes/450 ha in question, for the past three years” says Ms. Townsend, “and VicForests had repeatedly stated that it had no immediate plans to harvest in the Strathbogie Ranges”. So for Mr. Trushell to state that VicForests “…did notify the community groups…” (Country News 21.9.16), is plainly misleading. The last comprehensive forest assessment was done 30+ years ago. Current forest management is like the blind leading the ignorant. 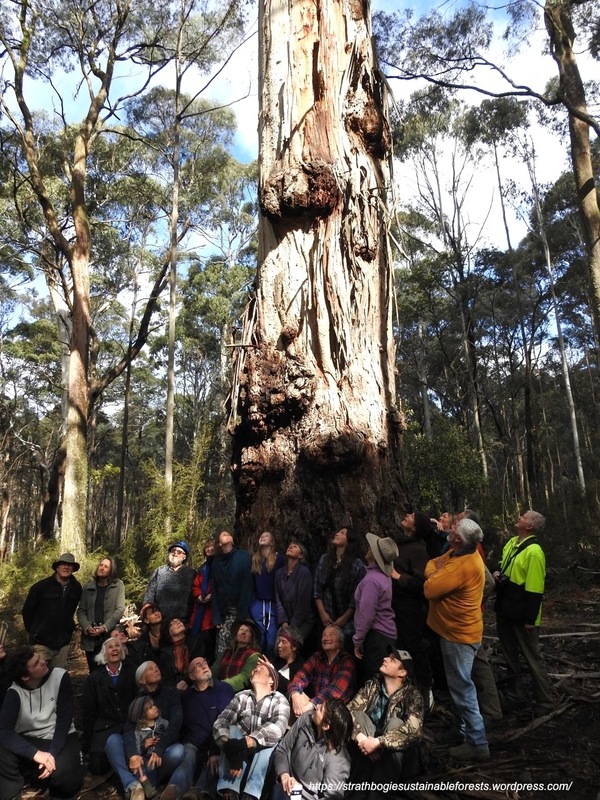 We want a moratorium on all native forest logging in the Strathbogie Ranges until there has been a comprehensive assessment of forest values. How else can we make good decisions? In spite of preparing coupe plans, VicForests have not adequately assessed Parlours coupe, or any of the other 10 coupes they plan to log, for significant forest values. There are known, resident Koalas in the coupe and Strathbogie forests are well-known for their high density Koala populations. The methods used by VicForests to survey and manage Koalas are seriously flawed. Any management plan developed by VicForests to protect the resident Koala community will also be flawed. Timber from Parlour’s coupe won’t even be processed in our district. It’ll be hauled 180 km south to a Warburton mill. When we last spoke to VicForests they assured us all the timber would be supplied to local sawmills. The policy document that regulates how forest values are managed is seriously out of date and does not provide adequate protection for a number of threatened species: Greater Glider & Powerful Owl. Parlour’s coupe is home to a high density of the Greater Glider, an FFG and EPBC listed species whose remaining stronghold in the Strathbogie Ranges is the Strathbogie forest. Current forest management has driven one species of gliding possum to local extinction. The Yellow-bellied Glider is dependent on big, old trees and a diverse forest of eucalypts – it’s gone from these forests. We don’t want any repeats. The Strathbogie forest, including Parlour’s coupe, contains some very big, old trees that likely pre-date European colonization of Australia. When the forest around them is logged they’ll certainly suffer. Many of the planned coupes are within or next to the Parlour’s Creek catchment. This 650 ha catchment contains some of the highest quality forest remaining in the entire Strathbogie Ranges. Logging this area is like performing open-heart surgery on the forest. VicForests have shown that they are interested in the timber in Parlour’s coupe, at the expense of all other considerations: community, forest health, local economy, koalas, good policy, good planning, informed decision making. NOT GOOD ENOUGH! You might have read in a previous post, that VicForests conducted a pre-logging Koala survey in Parlour’s coupe, though they incorrectly concluded that there were no Koalas living in the coupe. The pre-harvest survey methods employed are themselves interesting, but aren’t dealt with here. 1. That Koalas in tall forests can be reliably and effectively detected. 2. That the contractor logging the forests is suitably skilled, qualified and has the incentive to detect Koala sign and then interpret what it means. 1. Can Koalas be located in tall forests? Spot the Koala in this Narrow-Leaf Peppermint – see it? Finding Koalas in the canopy of a tall forest is always difficult, whether it’s daytime or night; the most skilled observer will always miss some. The taller the trees, the harder the task and the greater the likelihood of error. To add to the difficulty, tree canopies in forests are usually at least partly obscured by other trees, leaves and branches – not like the roadside tree in this pic. In short, it’s impossible to assess anything more than presence/absence of Koalas in tall forests – as VicForests’ survey has shown. Parlour’s coupe Koala 30 m up – his days are numbered! Not only are VicForests’ Strathbogie coupes home to Greater Gliders, Powerful Owls, Long-nosed Bandicoots and many other species sensitive to logging, it’s now clear that these forests are important Koala habitat as well. 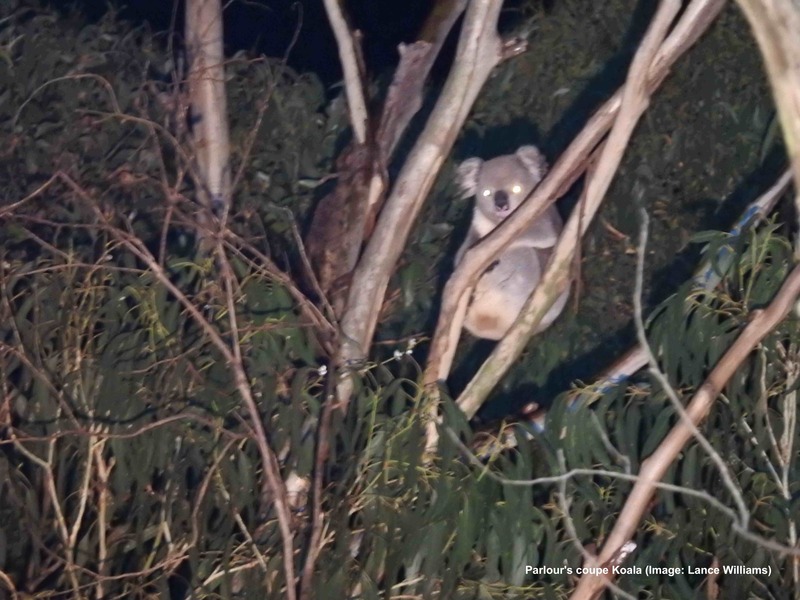 The Koala pictured above was found high in the top of a Victorian Blue Gum (Eucalyptus bicostata) during our recent spotlight survey of the coupe. 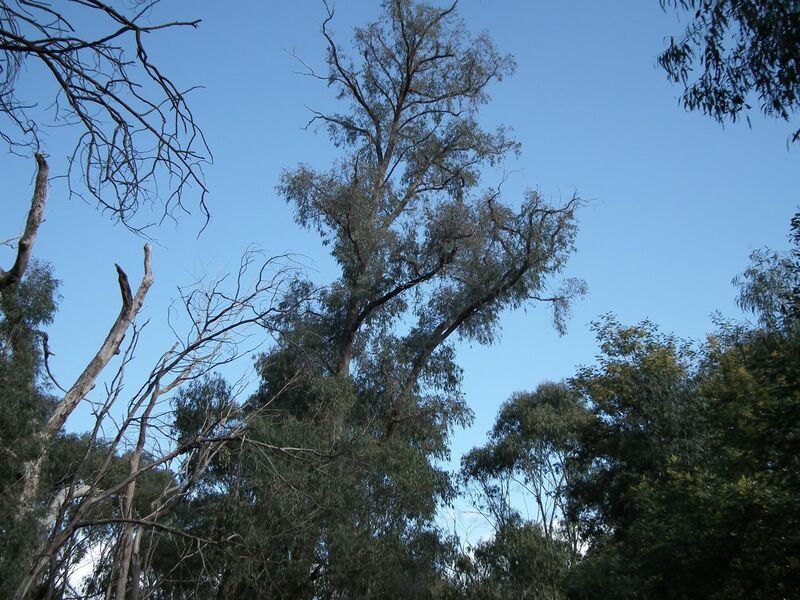 Koala droppings were also recorded in the coupe on a previous survey, though on that occasion we didn’t see the animal. And they’ve been recorded elsewhere in the forest (see map below). Koalas are big animals, with females weighing 7-11 kg and males 9-14 kg and 60-80 cm in height, yet they are extremely hard to find by sight during daylight, especially in the crowns of tall trees like those 30-40 m high Messmates, Blue Gums, Manna Gums and Peppermints in Parlour’s coupe. VicForests say they surveyed the coupe for sign of Koala. 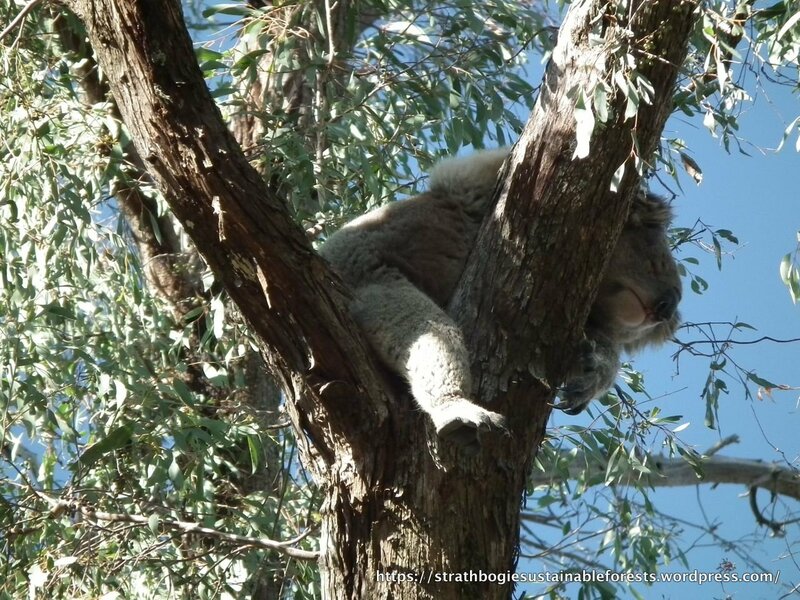 From the coupe report: ” Strathbogie Ranges are within a high density Koala population area. During coupe reconnaissance preferred feed trees for this species were identified. No Koalas or scats were observed during coupe reconnaissance.” (Coupe Report, Harvest Unit 412-504-0001-A – Parlours Creek, p.15). If VicForests’ survey missed finding Koalas in the coupe, what else have they missed? Either VicForests’ survey method for Koalas is flawed, or their expertise is wanting. Either way, it means the Victorian Government is selling the community and native forests short. This may be VicForests’ means of ‘ticking a box’, but it is not an effective way to mitigate injury or death of Koalas in a logging coupe where the trees are 30-40 m high and often have dense canopies. If the fauna survey failed to find any sign of Koalas in the coupe, when we know they live in there, what chance has the contractor got? 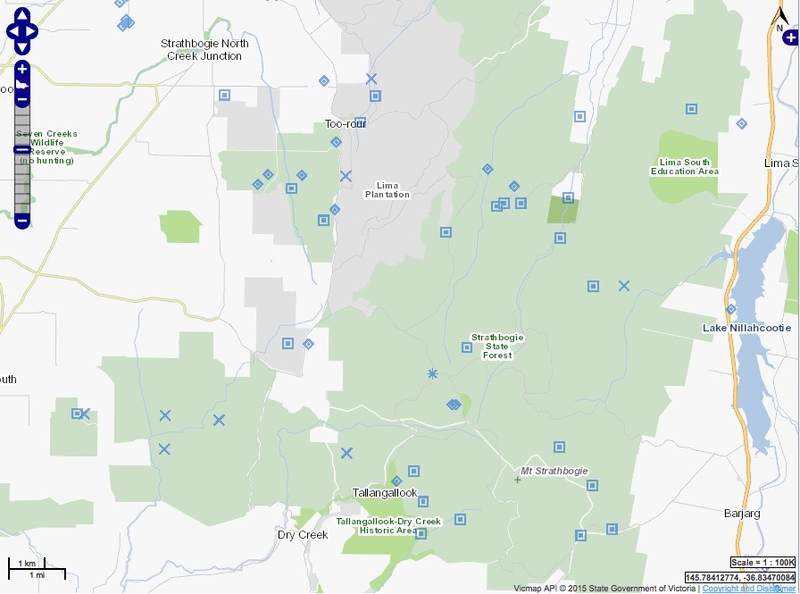 Koala records in the Strathbogie forest since 2000 (blue symbols). The reason there aren’t more records is because they are very hard to see in tall forest and there have been no Government surveys. VicForests has seemed reluctant to investigate the non-timber values of Parlour’s coupe, even though it’s their statutory responsibility – perhaps they’re worried about what they might find. So, we thought we’d help out. Our citizen science program visited that forest area a number of times in recent years, spotlighting, listening for owls and doing moth and fungi surveys, among other things. We’ve pulled together the information on the two high-profile threatened species that live in that coupe – assessment-of-parlours-coupe140916 (1.8 MB). Parlours coupe contains a number of high conservation values, none of which have been adequately considered in the pre-logging planning. Greater Gliders and Powerful Owls both occur in the coupe and the forest itself complies with the DELWP/VicForests definition of High Conservation Value forest. VicForests have conducted no on-ground fauna surveys for the above values, yet intend to log the coupe as early as the 19th September 2016 (6 days hence). The Planning Standards (DSE 2014) for the North East FMA are out-of-date and seriously inadequate. They make no mention whatsoever of the Greater Glider, which is now listed as threatened in Victoria and under the Federal EPBC Act. Greater Glider densities in Parlours coupe are as high as 11.7 individuals/km spotlight transect. These densities are high enough to be regarded as ecologically significant in East Gippsland and elicit special protection from logging (DSE 2014), but in the Strathbogies these values are ignored. During three formal visits to the coupe and its immediate environs over the last two years, individual Powerful Owls have been recorded on two occasions. The Parlour’s Creek catchment, including the coupe area is clearly part of a resident owl’s regular home range. The appropriate Special Protection Zone should be investigated and declared. There is concern that, although Powerful Owls are considered in the Planning Standards, the Powerful Owl Management Area ‘strategy’ has not been reviewed for some years and that areas set aside for Powerful Owls in the North East may not provide the level of protection intended. We urgently recommend that a moratorium be placed on all native forest logging in the Strathbogie Ranges until there has been a comprehensive ecological assessment. Vicforests’ inaction and indifference to their responsibility is quite staggering, particularly when they’ve repeatedly told us that they take sustainable forest management very seriously. Hmmm. 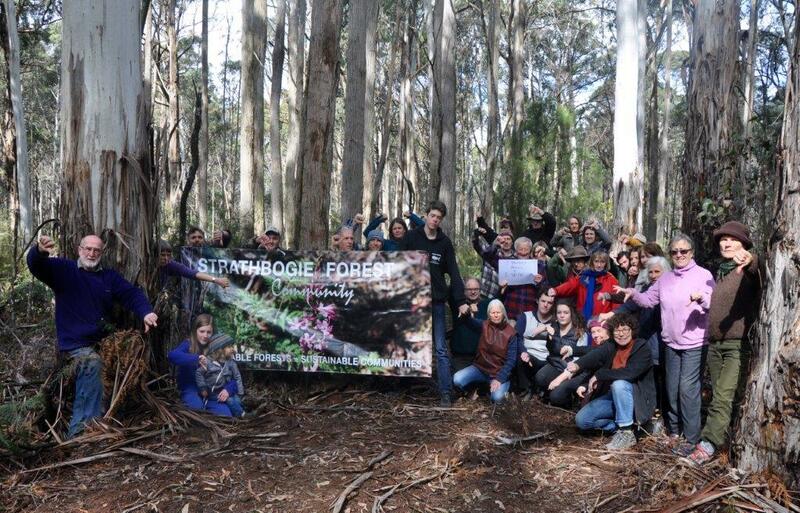 You can help the Strathbogie Forest! If nothing changes in the next seven days, VicForests will be logging in the Parlour’s Creek area and after that they’ll move into the rest of the 450 ha of Strathbogie forest on their books. It’s time to act – do it now. Don’t keep your anger to yourself – share it. Our government representatives are the ones that make decisions, but they’ll only act if there’s support (or even outrage). If you are one of our 273 Followers, use Facebook or Twitter to tell Dan, Lily, Jaala, Will, Steph, Brad (yes, tell every one of them, repeatedly!) that VicForests needs to take its logging plans for the Strathbogies off the table. 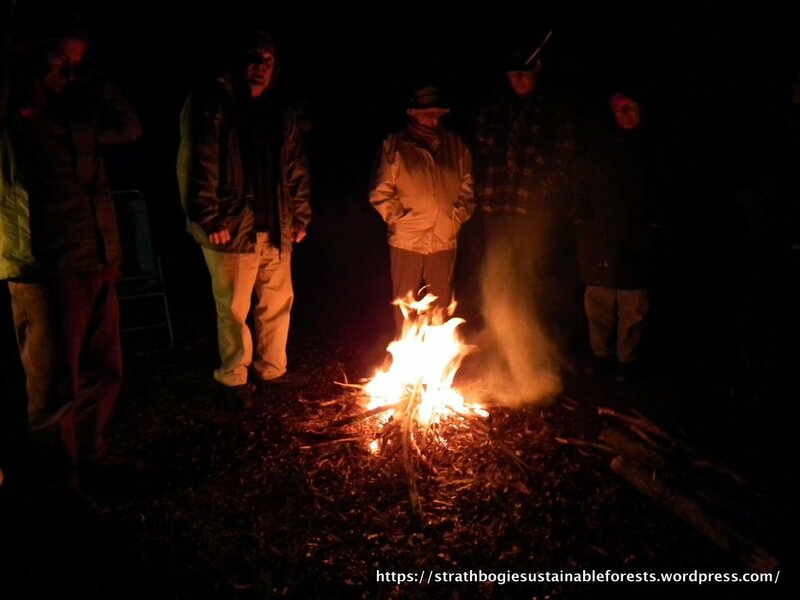 Last season we went through bitter conflict with DELWP over planned burning, before getting down to a productive relationship (via the Strathbogie Community Bushfire Planning Group). If this logging starts, conflict will return. Our community is fed up with the empty rhetoric of ‘community engagement’ followed by heavy handed, unilateral Government-sanctioned railroading. There are 11 coupes on the chopping block in the Strathbogie Ranges. These maps show their location. The official VicForests map gives coupe numbers. The other two are more realistic satellite maps. The arrow in each map indicates the coupe that VicForests plan to log next week on Lima East Rd, in the Parlour’s Creek catchment. The local community has long been telling the Government that the Parlour’s Creek catchment, where most of the coupes are located, contains some of the highest conservation value forests left in the entire Strathbogie Ranges. Yet, there has been no assessment of the conservation values of these forests since the 1980s, 30 years ag0! Instead of taking the community seriously and looking to the future, they stick their heads in the sand. The Government and VicForests want us to believe their logging plans are sustainable and will improve forest health and resilience. They might as well tell us they bought a tatts ticket! Click on a map to view. VicForests coupes in the Strathbogie Ranges. Satellite image showing coupes Vicforests wants to log in the next three years (Parlour’s coupe indicated). Pine plantations shaded brown. Major waterways in blue. Satellite image of coupes. VicForests’ 2006 failed coupe in center of image.